Day 5 of New York Fashion Week. 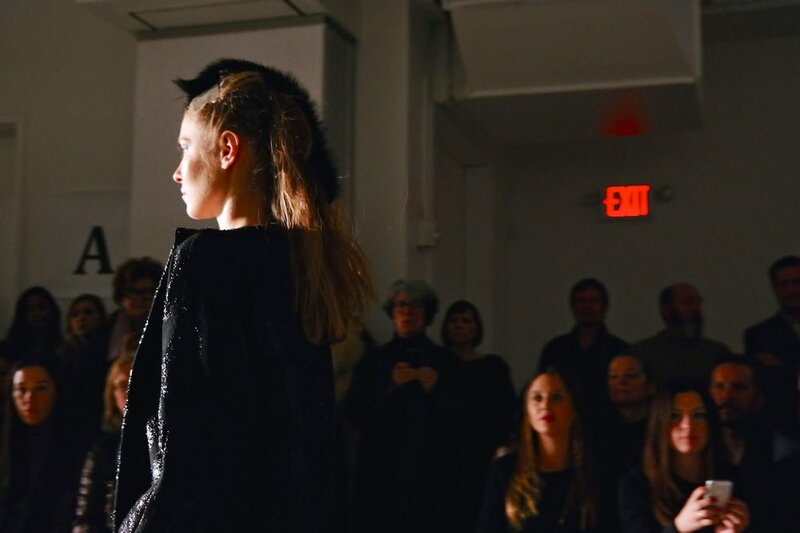 ZERO + MARIA CORNEJO hosted their 2015 Fall / Winter runway show. As with previous seasons, Cornejo chose to show in a stark white space on the West Side. The loft is almost completely bare, devoid of color and decoration, save for grid style windows. In my opinion, it's an excellent choice to allow the clothes to be able to stand out and speak for themselves. From what I saw, they had much to say. Show notes cite creative inspiration from the women who wear Cornejo's clothes resulting in a collection of contrasting textures and lean silhouettes. Major themes included horizontal stripes, an unmissable crimson hue, and a faux mohawk referenced in the hair, on the front of garments, and the backs of shoes. What I love most about her clothes is the ease in their elegance. An ease that is so hard to come by, but Cornejo has successfully done it again. With the inclusion of a single solid bold color and a graphic black and white print, the collection as a whole felt very much like classic MARIA CORNEJO, but no less new. Her work manages to remain consistent, but evolving. It was an exceptionally cold night even for New York in February. It was the kind of cold that gets deep down in your bones and leaves you feeling slightly weak. But, as I sat on a bench, watching the girls turn the corner one after another with exaggerated eyebrows and draped in shearlings, that cold... well, it all went away. This troupe of swiftly moving models made the duration of the show all too fleeting and immediately after the last girl turned the corner, I was longing for more. For more winter white, for more fur, for more of what CORNEJO has in store.